Have you heard of PopSockets? I have to be honest that I had never heard of them until a few weeks ago. I now am the proud owner of three PopSockets and am totally in love with them. So what is a PopSocket you ask? Well, it is best described as a phone grip and stand for your mobile devices. For us, we have them on our cell phones and my Little One has one on her 7 inch tablet. Our PopSockets allow our phones to sit on a perfect angle for seeing the screen. Depending on where you place your PopSocket on the back of your phone, you can also sit it sideways for viewing the screen for viewing tv shows or videos. 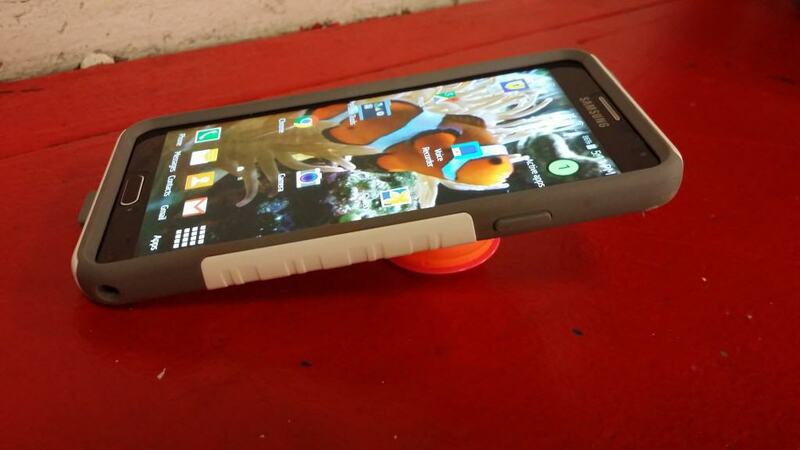 The above picture shows the PopSocket on the rear of a Samsung Galaxy Note which is a larger phone. The PopSocket is opened so you can see the accordion style way it pops out. The PopSocket closes with just pushing it in. The PopSocket can be removed and positioned in different spots on your phone. It attaches with a sticky back that does not leave residue on your phone. I have taken my PopSocket on and off a number of times already just with getting to know my preferred spot I like to have it on my phone and it still stays stuck on my phone as if brand new. 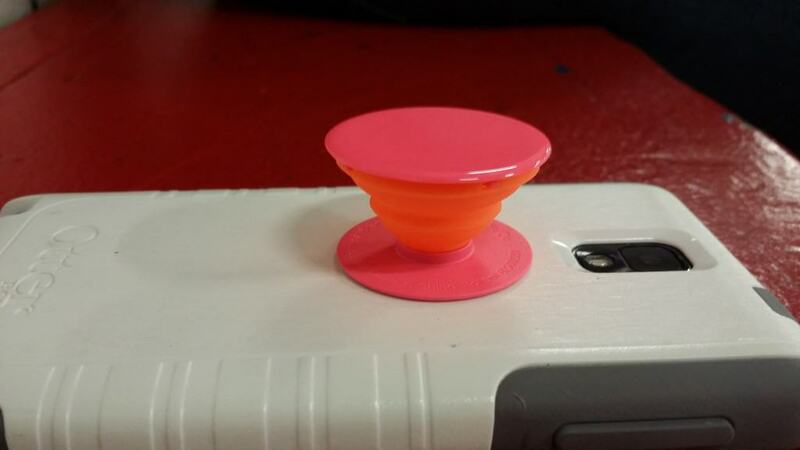 Here is an image of the PopSocket in action on one of our phones…. In the above image you can see how the PopSocket allows the phone to be resting at a great angle for seeing and reading your phone. I like to have my phone on my desk with the PopSocket open. The PopSocket allows my phone to be at the perfect angle so I can see all the information as my phone vibrates and the messages, emails, and calls come in. 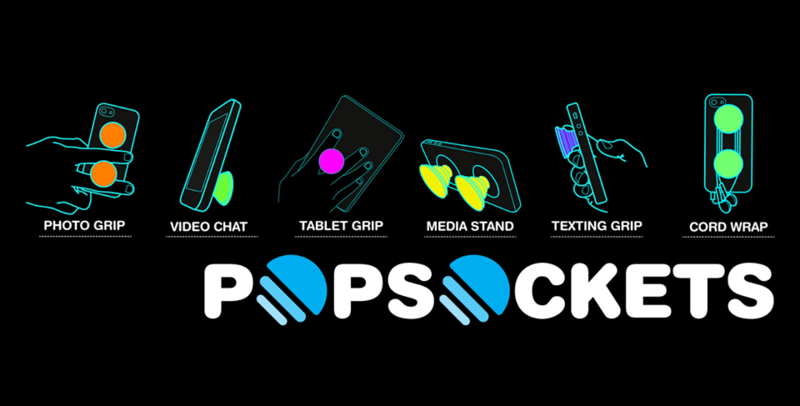 Here are a few details about PopSocket that you will want to know…. *When the PopSocket is closed it measures .25 inches so it does not add a lot to the back of your mobile device. *The diameter if the PopSocket is 1.5 inches. *Some people appear to like to put 2 PopSockets on the back of their mobile device and some prefer 1 PopSocket. I personally love just one on the back of my mobile device. *PopSockets are available in packages of 2 for those that love 2 on their phone or singles if you are like me and like just one on the back of your mobile device. *The PopSocket can be used to keep your earphones wrapped up if you like to have earphones with your phone. *You can design your own PopSocket! *As per the PopSocket website, there is free shipping on orders of $15 or more. I cannot see myself without a PopSocket on my mobile phone now. 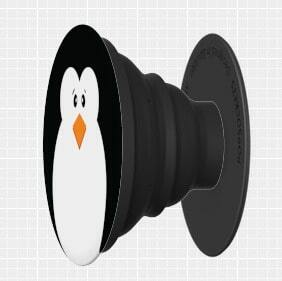 I am already eyeing the customize your own PopSocket section in anticipation of my next PopSocket. 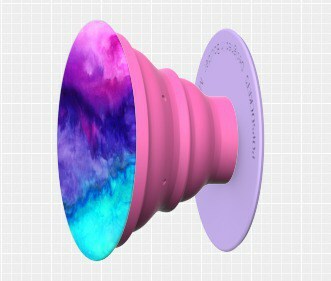 There are great options for customizing your very own PopSocket, such as colorful ones like this one…..
Those are just a couple of PopSockets I created with their customize your own PopSocket feature on their website. The combinations seem almost endless. You can shop for PopSockets at the PopSocket online store or on Amazon. Disclosure: MomMomOnTheGo was compensated for the purpose of providing this review. As always, MomMomOnTheGo only supports companies, products, and services that she loves.